Chicago police officer Jason Van Dyke leaves the Criminal Courts Building after pleading not guilty to first-degree murder charges related to the shooting death of 17-year-old Laquan McDonald on December 29, 2015, in Chicago. Van Dyke shot McDonald 16 times. Van Dyke gave his first TV interview to Fox32, and also sat down to speak to reporters from the Chicago Tribune. Unsurprisingly, for both interviews, he declined to discuss the shooting or its aftermath, instead focusing on how much he has gone through since Oct. 2014, when he shot Laquan McDonald 16 times. 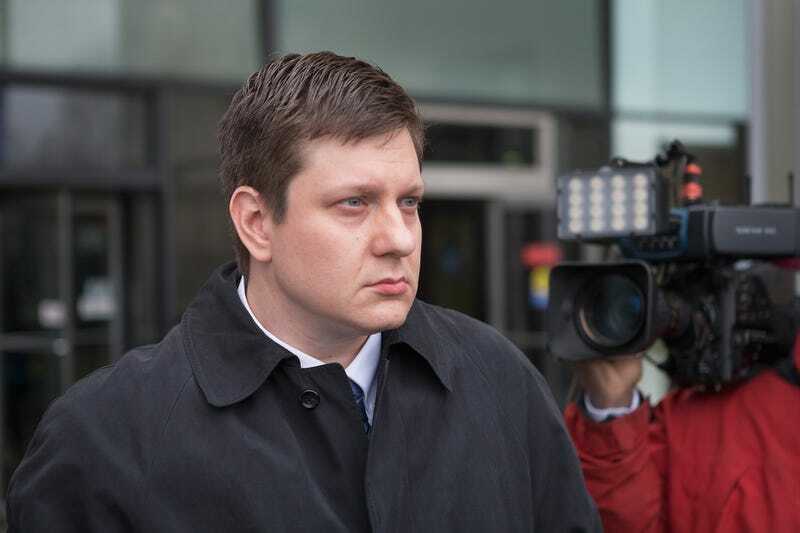 Van Dyke also noted that he has had several confrontations with individuals holding knives or guns, but has resolved those using de-escalation, rather than force, having never before fired his gun, something that he repeated several times to the Tribune. Of course, by now, we all know that police claimed immediately after the shooting that McDonald had lunged at police “swinging the knife in an aggressive, exaggerated manner,” and ignoring orders ... details that the dashcam footage contradicted when it showed Van Dyke emptying his weapon at McDonald within seconds of arriving on the scene. Van Dyke’s partner Joseph Walsh and two other officers, Detective David March and officer Thomas Gaffney, backed up those claims, and have since been accused of allegedly covering for Van Dyke in the fatal shooting and are charged with conspiracy, misconduct and obstruction of justice. Despite this, Van Dyke’s attorneys are arguing that the video, which does not have audio, does not show the officer’s vantage point when he pulled the trigger and emptied his weapon within 15 seconds. Nonetheless, Van Dyke said he hears the protesters and understands why they are protesting. However, he believes some of the anger is being misdirected, noting that his family has been receiving death threats and his 12 and 16-year-old daughters have been targeted at schools. “It’s impacted them socially. It’s impacted their friends. It’s impacted their schoolwork, their life at school where they’ve been the target of this … My oldest one has had notes left on desks stating 16 shots. She’s been ridiculed because of it,” he told Fox32. Van Dyke also thinks that politics played a role in his current situation. “I strongly believe that politics was heavily involved with this since the beginning … I would like the jury to know the facts of the situation that happened ... And I would like them to make a decision based on evidence and not on opinion,” he said. And of course, woe is he whose life—which he still gets to live—will always be vastly different, if acquitted. Jury selection for Van Dyke’s murder trial is scheduled to begin next week. Van Dyke is currently on suspension without pay or benefits.